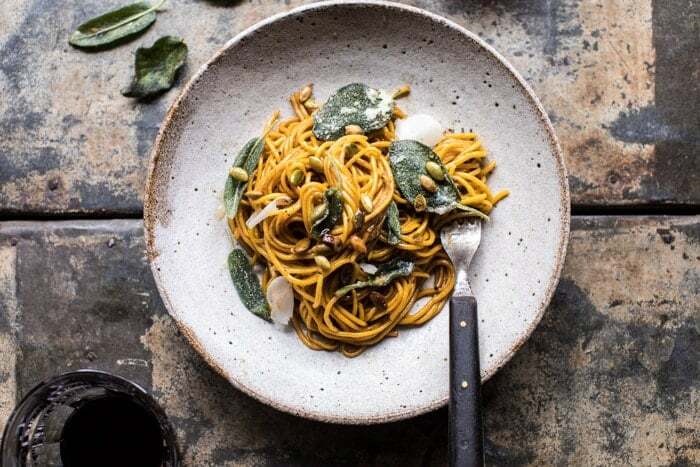 I warned you it was coming, and today’s the day, 2 ingredient pumpkin pasta with balsamic sage brown butter sauce. There’s no denying it, this fall I am on a pumpkin kick. 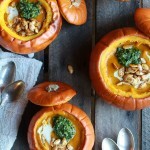 Somehow last fall I managed to post just the right amount of pumpkin recipes, but this year? I have too many ideas and I love them all…so you’ll be seeing lots of the orange stuff this season. I am personally pretty excited about it, and I think you guys will be too. Especially after your reactions to Tuesday’s pumpkin spice oatmeal latte…sure seems like you guys are into the pumpkin recipes. And everyone? 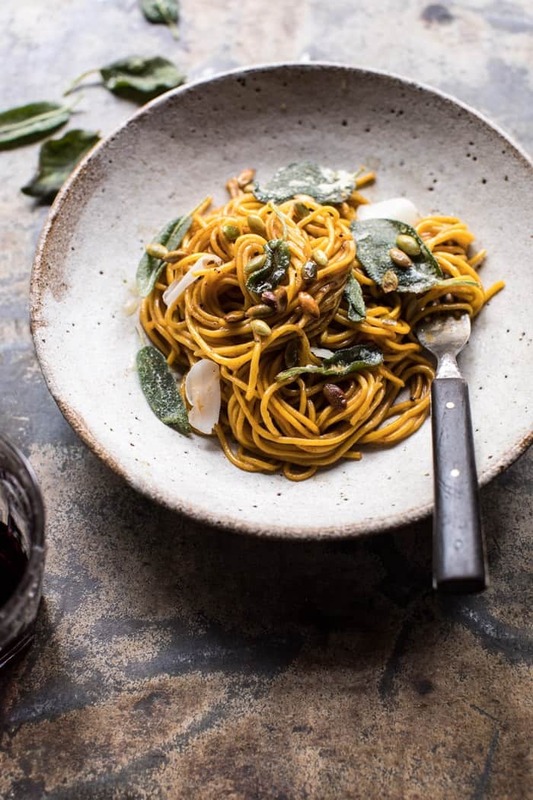 This pumpkin pasta is like no other you’ve ever had. 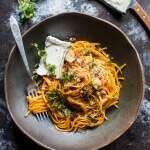 One, it’s REAL pumpkin pasta, and two, balsamic brown butter sauce. I know that homemade pasta can be scary, time consuming, and at times leave you wanting to you pull your hair out. Trust me, I’ve been there. But this pumpkin pasta is by far the easiest homemade pasta I’ve ever made, and it also happens to be delicious. 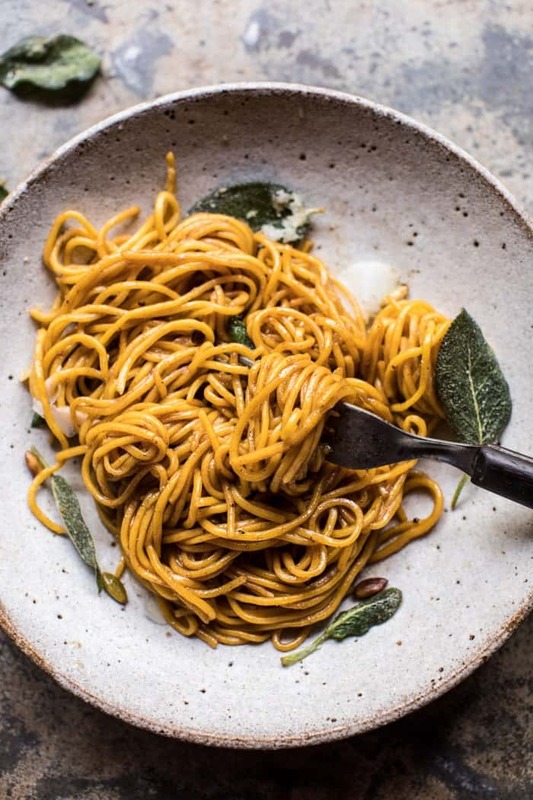 The pasta is almost too simple, pantry staple ingredients…just pumpkin (I always have twelve cans of pumpkin on hand…year round…honestly) and all-purpose flour. BUT I will tell you that making homemade pasta is definitely a lot easier and quicker with a pasta machine. Sorry, just being honest. 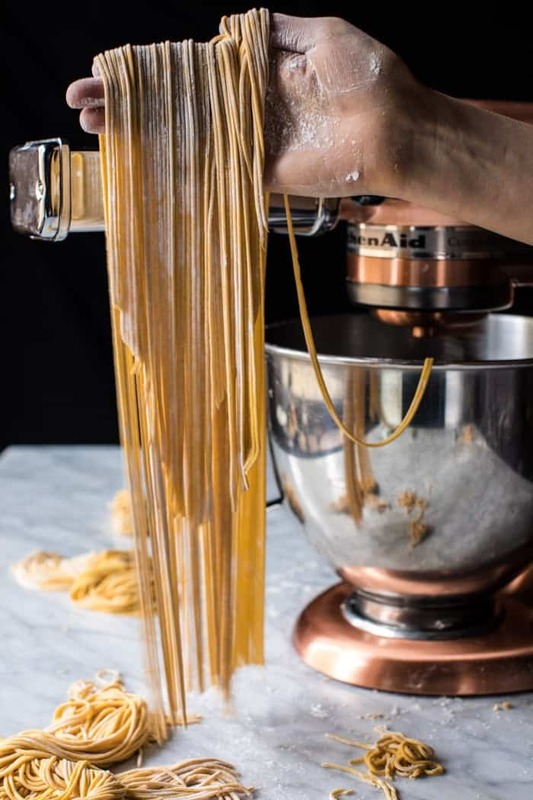 Yes, you can do this all by hand, but it’s totally going to take you twice as much time than if you used a pasta machine. I love the KitchenAid pasta attachments. They work so well and if you plan to be making pasta this fall (you should, you should) then I recommend investing in them. 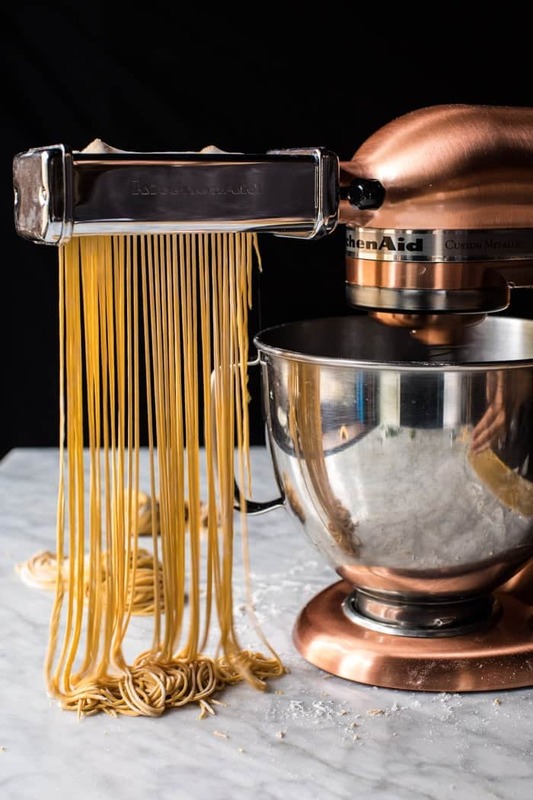 Trust me, they make making pasta fun and painless. I left the size of the pasta up to you. I went with more of an angel hair size, but I think fettuccine would work equally well with this sauce. And speaking of the sauce. It is so good. That’s really all I have to say. It. Is. So. Good. I’ve made this three times now and I am still so excited about it. It’s just the perfect warming fall dinner. Also, speaking of being excited, happy Thursday! Anyone else totally ready for the weekend? My week started out a little, um, odd I guess. I was supposed to head to Louisiana for work early Monday morning, but our semi-out of season snowstorm (yes, snowstorm) closed the highway down and I was not able to make my flight. Asher had a snow day, there were power outages all over the county, and plenty of white flakes falling from the sky all day. Not sure what it is about me and flights these days, but we’re just not meshing all that well. It actually ended up working out ok. I stayed inside, caught up on work, and prepped for filming recipe videos today, tomorrow, and through the weekend. I have Kai in town and it’s go time for videos, so if there’s any fall/holiday recipes you guys would like to see please let me know in the comments! 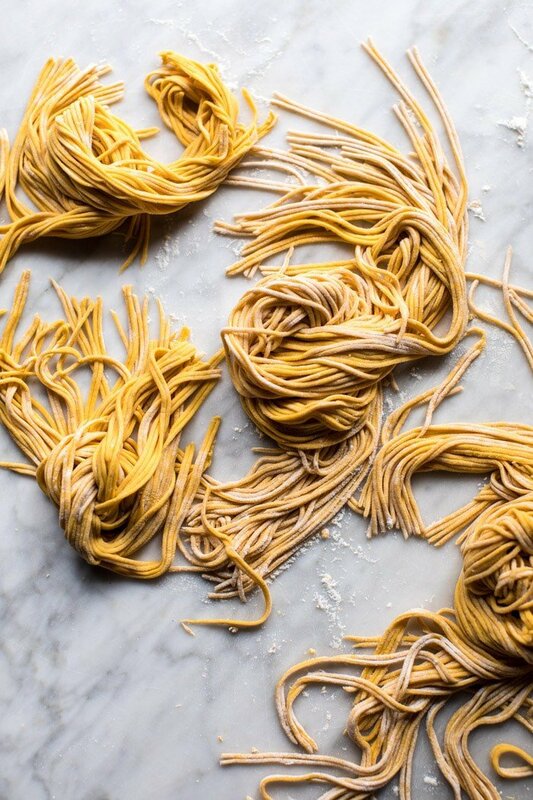 For now, let’s all agree that our Thursday night needs some buttery homemade pumpkin pasta. Sound good? 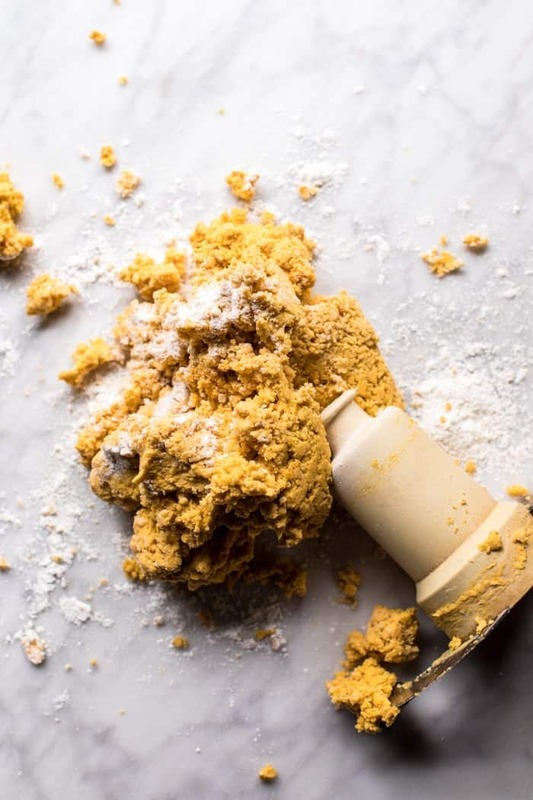 Yup, just pumpkin and flour. Simple as that and you don't even need to add water. 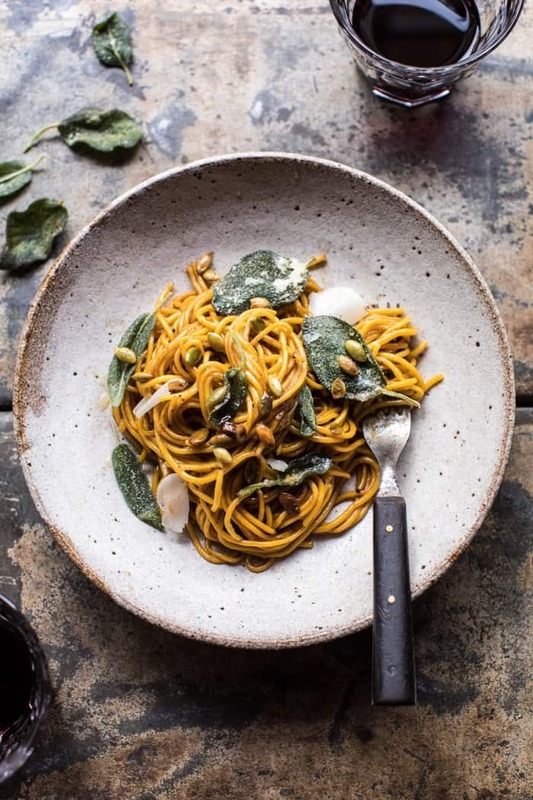 The pumpkin acts as the magical binding ingredient and leaves you with the perfect pumpkin pasta every single time. 1. Bring a large pot of salted water to a boil. Generously dust a baking sheet with flour. 2. 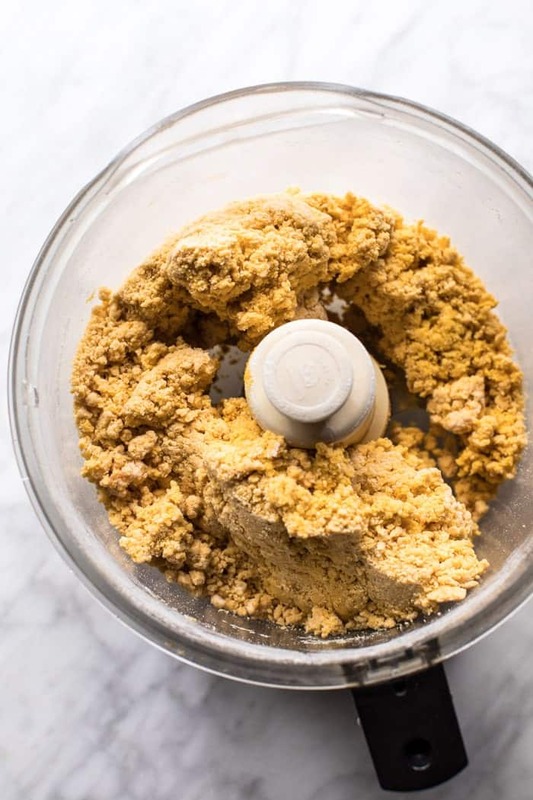 In the bowl of a food processor, combine the pumpkin and flour and pulse until a dough forms. Alternately, this can be mixed by hand or in a stand mixer. 3. Dump the dough out onto a flour surface and cut into quarters. Roll and cut the pasta into your desired shape by using either a pasta machine or rolling pin and a sharp knife. Transfer the cut pasta onto the prepared baking sheet. If not cooking right away, cover and refrigerate for up to 4 hours. 4. Drop the pasta into the boiling water and cook until al dente, being careful not to overcook the pasta. Drain. 1. Heat the butter, garlic, and sage in a large skillet over medium-high heat and cook butter until it begins to brown, about 3-5 minutes. Remove the garlic and sage from the skillet. 2. Slowly pour in the wine. Add the balsamic and season with salt and pepper. Simmer the sauce for 2-3 minutes. Add the pasta and gently toss. Cook another 2-3 minutes or until the pasta is warmed through. 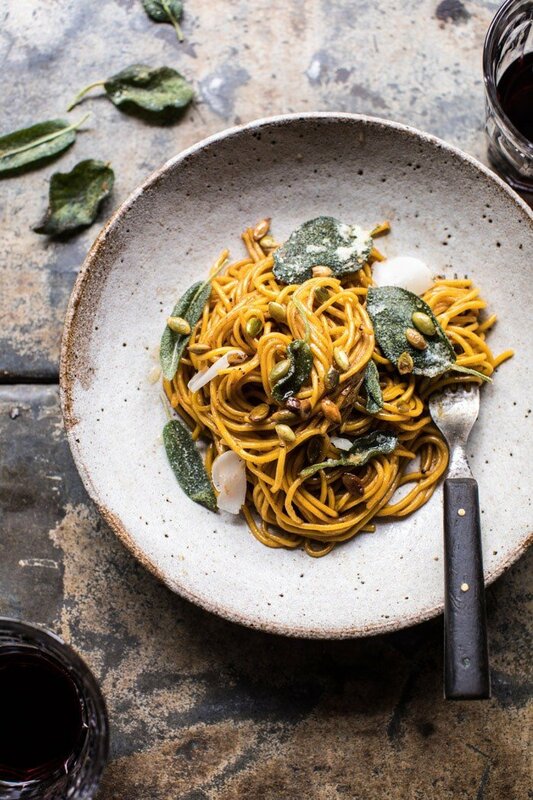 Divide the pasta among plates and top with sage, manchego, and pumpkin seeds. EAT. *Pasta adapted from Food Network. K. Cool. 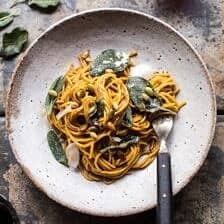 Let’s make this pumpkin pasta then! 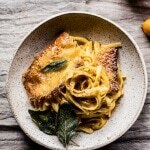 Brown Butter Pumpkin Fettuccine Alfredo with Fried Cheese. I’m so sorry about the flight issues 🙁 But yay for another fabulous pumpkin recipe – bring on the pumpkin all season long! So glad you’re loving the pumpkin!! Thank you Liz! Love the look of this pasta. It sounds amazing. Gotta admit I have a tried and true old fashioned pasta roller. It clearly needs to have a go at this pasta! BTW. Love the look of your new email style! That new HBH logo looks amazing! Ooo yes, try it with this! I hope you love it! Also so glad you like the email style. Thank you!! This simple? Just two ingredients? However, I’m wondering, if it will work with different type of flour. What about almond, coconut or even banana? What do you think? Nevertheless, sounds delicious, that sauce is interesting. And photos? Pure perfection! As always.. I am not sure as O have not tried it with other flours. Let me know if you give it a try! 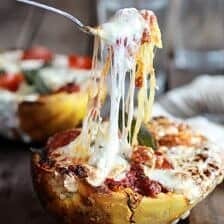 Could you use this recipe to make a stuffed pasta like ravioli, or would it not seal on the edges very well without egg? 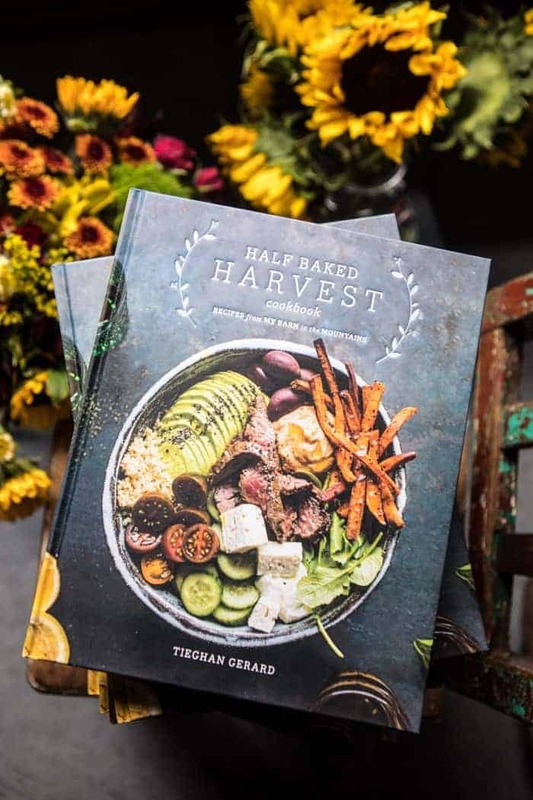 Yes this is so perfect for fall! Thank you Kelsey, I hope you love it! Thank you Jess! I am so happy you’re loving this, hope it turns out amazing! YUM! I may just have to try those, they sound amazing! Thank you Missy! Could you use a pie pumpkin and puree it? We got one in our CSA this week and wondering if that could work. 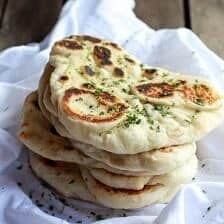 Would gluten free all-purpose flour be adequate? Can you use whole wheat PASTRY flour for the pasta? I love love love making pasta by hand!! This looks so so good! I am a giant fan of brown butter sage sauces on top too. Who wouldn’t be a fan of something like this!!?? We have some people with egg sensitivities in our life, so an-egg-less homemade pasta like this is a great solution. So excited to give this a spin!! I am so happy you’re loving this Maria! Also glad that everyone can enjoy this recipe! Thank you! Looks delicious! Any tips for making the pasta by hand? Would be my first time doing so (making pasta, that is). Is it as simple as rolling it out and cutting it into spaghetti/fetticini lengths? Careful though on the cooking time – I don’t think the recipe gives one for boiling the pasta – 1.5-2 minutes worked for me (plus tiny bit of cooking time with the sauce). Any more would have turned the pasta to mush!! I am so happy this turned out amazing for you Rose! Thank you! Do you realize how much pasta this makes when it goes through a pasta machine?? We stopped after a half batch and it was still more than enough for 4 people. Besides that, it was delicious! I am glad you all enjoyed this! Thanks Maia! 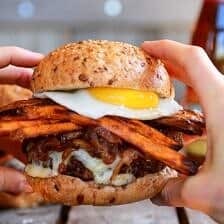 This is such a great recipe! 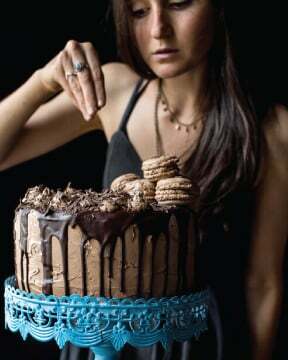 I wanted to let you know I made this using Cup4Cup gluten free flour and it worked just as well! The pasta turned out lovely! 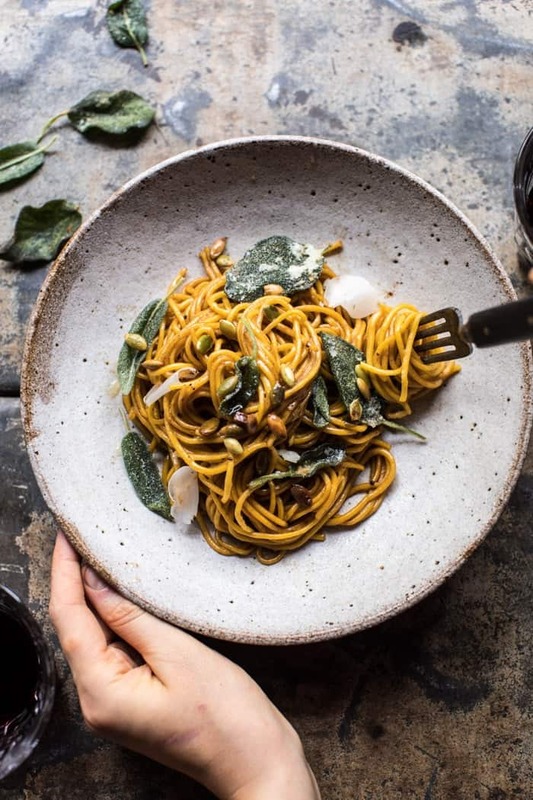 This is definitely my new go-to pasta recipe! That is so great! 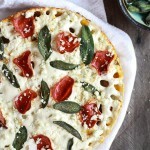 I am really glad this worked with gluten free flour Robin! Thanks! I made this and it was good. I will make it again. I tried it primarily for the pasta – it was super easy and came out quite well, I can see the pasta becoming a go-to. Friends loved it. Thank you for sharing it with us! If any viewer is thinking about trying it, I can recommend it. That is so amazing! I am so glad you and your friends loved this Karyl! Thank you! I realize I’m a little late to the party with my question here, but I was looking up pumpkin recipes for Thanksgiving. 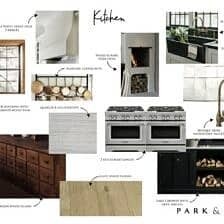 Do you think this would work for making gnocchi as well? Glad I asked before attempting this! Thank you for answering my question, and I hope you have a Happy Thanksgiving too! No problem! I hope you love this Diane and Happy Thanksgiving!